Ingredients (Drinks and Bee Products) API's Original Special Ingredients(Royal Jelly / Propolis)｜API Co., Ltd.
Royal jelly is a special food for queen bees. Only larvae fed with royal jelly can become queen bees. Queen bees weigh twice as much as worker bees and live 40 times longer. A powder of vacuum freeze-dried fresh royal jelly. This is used as an ingredient in the food that should avoid moisture and the supplements that require high concentrations of royal jelly. 1 g of dried royal jelly powder is equivalent to 3 g of fresh royal jelly. Properties: Milky white or milky yellow powder, water: less than 5%, decenoic acid: at least 5.0 g.
This is the powder form of deproteinized royal jelly extract. 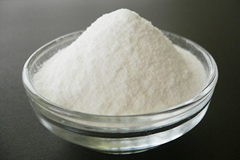 It is a convenient alternative to the extract.It is used in soft drinks and jellies. 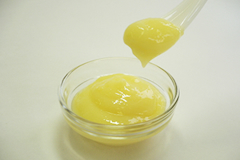 1 g of deproteinized royal jelly powder is equivalent to 1 g of fresh royal jelly. Properties: White powder. Water: less than 5%, decenoic acid: 1.6 - 1.8%. Propolis is an antibacterial and antioxidant resin that honeybees collect from buds or other botanical sources and store in their hives. API uses only the highest grade Brazilian green propolis. 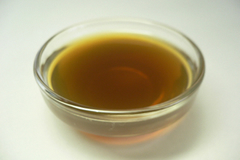 EEP-B20 is an ethanol extract of propolis at a concentration of 20%. 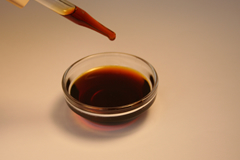 Properties: Transparent blackish brown liquid. 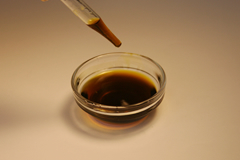 EEP-B20E,F is a highly water dispersible ethanol extract of propolis at a concentration of 20%. There are two types (Quillaja saponin or ginseng) available depending on the kind of saponin. 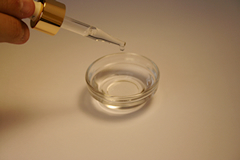 Propolis extract A-02 is an ethanol extract syrup emulsion at a concentration of 2%. We emulsified the product in advance to make it easier to use in soft drinks. This 1% water extract has a milder flavor and aroma than the ethanol extract and does not stain easily. 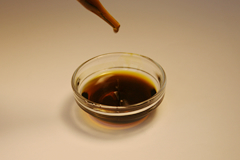 Properties: Transparent dark brown liquid with at least 1% dry residue. 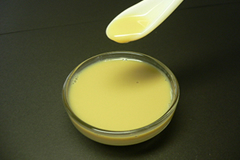 This product is a syrup emulsion containing a 2% extract of ethanol and water. We blended the best propolis ingredients using two extraction methods. 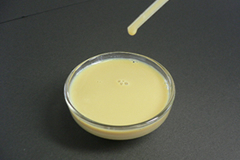 Properties: Yellow to pale yellow-brown viscous liquid. 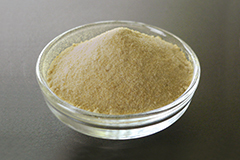 EEP-B10P is a propolis powder containing a 10% ethanol extract. 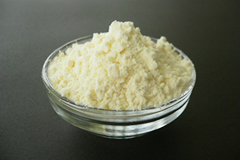 We created this powder to be suitable for mixing and kneading. Pollen refers to the balls of pollen that honeybees collect from flowers. Research is underway to reveal the outstanding nutritional performance of pollen. This product consists of pollen balls collected by honeybees dried as they are. 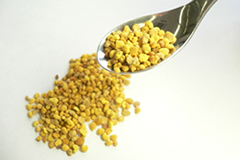 This is an extract of honeybee pollen. This pollen was processed with a clarifying filter, after having realized a low molecular weight with enzymatic treatment. Properties: Viscous yellow brown liquid. At least 65 Brix.